100's of books are listed in the categories to the right - just click on the topic you want to check out. Below are some of our featured items. Only 1 left!!! Rare, out of print, jacketed HARDCOVER book that will amaze Ford lovers. 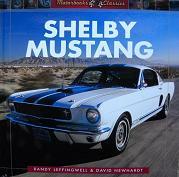 A complete color history of the Shelby Mustangs. The book is mint except for the back dust cover. A section is torn off. Click for lots of photos. This book demonstrates the newest fabricating techniques and covers the latest in welding equipment. This complete guide written by NASA welding consultant Richard Finch helps a fabricator select the proper equipment, prepare jigs, and effectively weld 4130 steel, stainless steel, aluminum, and magnesium. It also covers plasma cutting, the technique used extensively on Monster Garage that has revolutionized metal working. 2nd ed. The book explains all the techniques and products needed, lays out detailed schedules, and explains the cost in time. By allowing readers to stop the progression of projects wherever or whenever they wish, this book appeals to a wide range of readers. The crisp, all-color photography demonstrates the results that can be achieved through proper detailing and helps illustrate the techniques that anyone can use to make their car look good as new. Click for more info. A unique look at motels, service stations, restaurants, truck stops, and museums, and the colorful folks who continue to whittle out a livelihood along Route 66. Click the image for more details. Take an interesting look at Can-Am racing from 1966-1972 as published by Car & Driver, Road & Track, Autosport and more! Rare, out of print book. We only have 1 copy left in new condition. This performance portfolio includes reprints of articles published by various magazines between 1990-98. Lots of color and black and white photos, plus excellent articles and stats, including road tests of 90-98 Vipers. Approx. 140 pages. Covers Dodge Viper GTS, RT/10, ACR, GTS-R, Venom 500 & 600 and more. Author and autocross addict Richard Newton has covered every aspect of autocross from car and class selection to setup and driving. Four friends began vacationing at Seneca Lake, NY with their parents at age nine. Even though they only had two weeks together each summer, they built lifelong bonds. Much has changed over the years, and who they are now seems a long way from who they were then. With their 50th birthdays approaching, thoughts about the �meaning of life� fill their heads. But there will be challenges ahead as they embark on an unexpected journey into their past that proves to be both wondrous and deadly.